During a conference on religion and peace, a Protestant minister came up to me toward the end of one of our meals together and said, “Are you a grateful person?” I was surprised. I was eating slowly, and I thought to myself, Yes, I am a grateful person. The minister continued, “If you are really grateful, how can you not believe in God? God has created everything we enjoy, including the food we eat. Since you do not believe in God, you are not grateful for anything.” I thought to myself, I feel extremely grateful for everything. Every time I touch food, whenever I see a flower, when I breathe fresh air, I always feel grateful. Why would he say that I am not? I had this incident in mind many years later when I proposed to friends at Plum Village that we celebrate a Buddhist Thanksgiving Day every year. On that day, we practice real gratitude—thanking our mothers, fathers, ancestors, friends, and all beings for everything. If you meet that Protestant minister, I hope you will tell him that we are not ungrateful. We feel deeply grateful for everyone and everything. The very things that Nhat Hanh describes (food, flower, fresh air) are examples of those things of “pleasing quality” that come to us unbidden. Grace can fill our lives, if we let it. With that in mind, here’s a small group ministry session on Grace. Grace is the light or electricity or juice or breeze that takes you from that isolated place and puts you with others who are as startled and embarrassed and eventually grateful as you are to be there. Brian C. Taylor, Rector of St. Michael and All Angels Episcopal Church in Albuquerque, New Mexico, explores the core teachings of Jesus. Here is an excerpt on grace. I grew up in the San Francisco Bay Area, and used to surf as a teenager. Sitting on a surfboard in the water, you must wait. You must be attentive, watchful, ready. When a swell comes along, you must apply your energy, paddling quickly with the wave. If you don’t put in any effort, the wave passes you by and you go nowhere. But if you do point yourself in the right direction and paddle, and if it is the right moment, then the power of the wave — much stronger than your own weak paddling — matches your effort, picks you up, and carries you forward. This is how our willingness can be utilized by the Spirit to affect real change. We cannot make ourselves holy, any more than surfers on a calm ocean can paddle themselves frenetically forward into a glorious ride. But we must be willing and attentive, or nothing will ever happen. With awareness, we wear down our resistance, our obstacles, our compromises. We attend to our desire for change, waiting watchfully, hopefully. Then when the healing waters are stirred by the Spirit, we must do whatever it takes to get ourselves into the water. When the wave begins to move us upward and forward, we must aim in the right direction and paddle. The moment for decisiveness and conviction does come. Having waited attentively with a willing heart, at some point we reach a moment of clarity. In this moment, we know, without a doubt, that there is only one way forward that leads to life. If we step back from this moment, we become like the rich young man, skulking away sorrowfully, for we have knowingly denied an important chance offered by God (at least until it is offered again). But if we put our hand to the plow and don’t look back, risking it all for the opportunity to be spiritually transformed, our decisive action is joined with God’s intention for us. There is a place for decisiveness. At times, we must catch the wave, without hesitation. This moment of action does not come every day, and we can’t force it willfully. But we can prepare for it, so that finally, when the heavy obstacles of our resistance have been worn thin, we become light enough for our determination to be raised up and carried forward by the divine movement of grace. Questions: A real obstacle to grace is our refusal to accept the help of others. Recall a situation when you did not want to rely upon the good will of someone else. What was the source of your refusal? Grace can never be possessed but can only be received afresh again and again. To Practice This Thought: Open yourself to the unexpected by reciting these three affirmations based on Frederick Buechner’s definition of grace. There’s nothing you have to do. Group Session Plan based on resources on Grace from www.spiritualityandpractice.com. For a PDF version of this small group ministry session, click here: Grace. Faith! Huh. What Is It Good For? Funny thing happened on the way to preparing this week’s small group ministry session: I became a little uncomfortable with the material offered on the subject at SpiritualityandPractice.com. They define it a couple of different ways in the “basic practice” section of Faith. One definition is “an acceptance of certain religious doctrines.” The other is “an awareness of and an attunement to God’s presence in our everyday experiences.” If these are the only definitions of faith available to us, I could imagine many humanists answering the question posed in the title of this blog with a hearty, “Absolutely nothin’, say it again, ya’ll!” And I wouldn’t blame ’em. Which is why I’ve spend a lot of my time passing along this (hopefully) more palatable definition of faith by Wilfred Cantwell Smith, “Faith at its best has taken the form of a quiet confidence and joy which enable one to feel at home in the universe.” (I found this, by the way, in “Faith Reduced to Three Questions,” an excellent—and brief—essay on the subject by Judith Frediani from her days as Director of Lifespan Faith Development at our Unitarian Universalist Association). I’ve found that this definition is generally greeted with nods of agreement by UUs of all theological persuasions, so I wanted to present it as a foundation for the following small group ministry session on Faith. Oh, and I’m adding graphics to all future posts because, well, that’s just what you do in the blogosphere these days. Meditation teacher Sharon Salzberg melds incidents from her life and Buddhist teachings to re-imagine this important human faculty. Here she makes distinctions between beliefs and faith. When we hold a belief too tightly, it is often because we are afraid. We become rigid, and chastise others for believing the wrong things without really listening to what they are saying. We become defensive and resist opening our minds to new ideas or perspectives. This doesn’t mean that all beliefs are accurate reflections of the truth, but it does mean that we have to look at what’s motivating our defensiveness. . . . Questions: Talk about a time when you found the ability to move forward in your life, even without knowing what was yet to come. 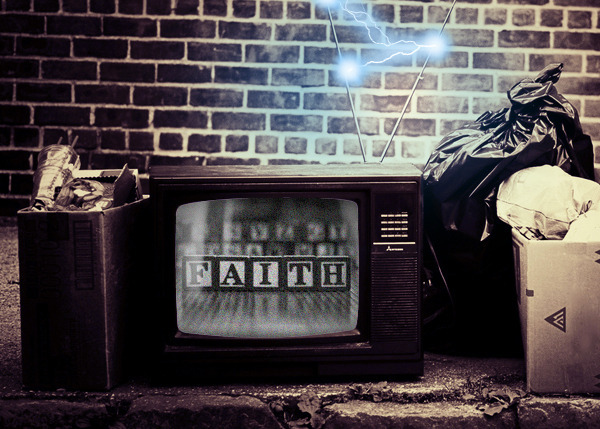 The whole future of the Earth, as of religion, seems to me to depend on the awakening of our faith in the future. Group Session Plan based on resources on Faith from www.spiritualityandpractice.com. For a PDF version of this small group ministry session, click here: Faith. It Matters What We Believe. Really. Blogging was a little light last week because I spent most of my time preparing for and attending the Prairie Star District Annual Conference in Des Moines, Iowa. All in all, I’d have to say the event was a wonderful success. Close to 300 children, youth, and adults attended three days of events, including presentations by two Prairie Star ministers (Brian Eslinger and Kendyl Gibbons), lots of informative workshops, some good multigenerational fun, and a fantastic worship service on Sunday morning, led by First Unitarian Church of Des Moines’ minister Mark Stringer. For my part, I attended the PSD Board of Directors’ meeting on Thursday evening and all day Friday, took part of a round table discussion on adult religious education, gave a brief report at the district’s annual business meeting (the real reason we actually do these conferences), and made myself available for the fine folks from Prairie Star to let me know how they thought things were going. I was happy to hear from several people that they appreciated this blog and my other social media efforts like Facebook and Twitter. I had more that a few conversations about the implications of “regionalization” on the services offered to congregations by the Prairie Star staff, too. I found it encouraging that most folks I talked with seemed to understand that moving forward with a plan to share administrative costs and structures among the three districts that make up the MidAmerica region of our Unitarian Universalist Assocation (Prairie Star, Central Midwest, and Heartland) is a wise and timely move. Personally, I find the prospect of working more closely with the field staff in our sibling districts exciting. Even more exhilarating is the thought of being in relationship with more congregations across the region. You’ll be hearing more about how this process is going in the coming months and years. Finally, from time to time I like to provide photographic evidence that: 1.) I actually do exist beyond the virtual world of the interwebs; and 2.) that I actually do meaningful work in the real world. 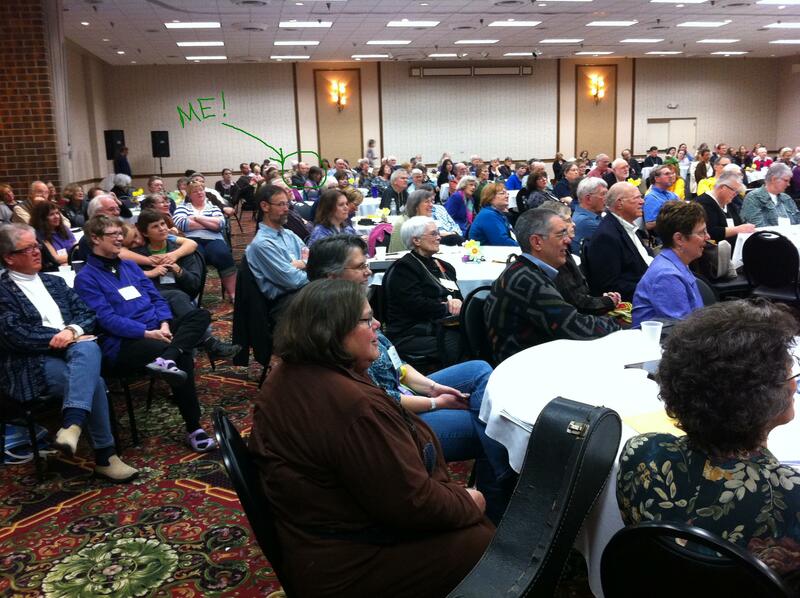 So here’s a snapshot of me attending the opening night festivities at the PSD Annual Conference. No grungy fonts here, my friends. St. Andrew’s Presbyterian Church’s website rocks like a cover band sleepwalking through the Eagle’s “Desparado.” But this series of posts isn’t about whether or not a church’s website is kinda hip, kinda now, kinda happening. It’s all about how well a congregation is using its website as a tool for faith development and spiritual growth. I have to confess, though, that I find it a little disheartening that the average mainstream Protestant website I’ve seen is about as fresh and edgy as a Rick Springfield video. Which means the average Unitarian Universalist website is, what? I’m thinking James Taylor. So here’s what’s happenin’ with this site. I really love that users are able to download the sermon-based small group discussion questions. Someone who’s never darkened the door of Saint Andrew’s bricks-and-mortar campus could listen to a sermon online (or download the podcast) and snag a copy of the small group discussion questions for said sermon. An excellent example of offering web resources that enable non-attenders to get not just a taste of what Saint Andrew’s is like, but a fairly substantial spiritual meal. And of course, those same resources are available for the leaders of the congregation’s small groups to use for their face-to-face meetings. I also like that they’ve put together a CD Box Set of a recent sermon series call “WikiFaith.” Soft rock aficionados love CD box sets. Unfortunately the series isn’t offered in vinyl as well, so hipsters are out of luck. Today’s small group ministry session based on resources from SpiritualityandPractice.com is on Enthusiasm. Rich Heffern, associate editor of Praying Magazine, writes about Christianity as a gateway to a sacred adventure that permeates all of life. In the following passage, he celebrates enthusiasm as a spiritual practice. Hildegard of Bingen, twelfth century mystic, counseled her spiritual directees to be “juicy people,” folks who are so filled with wonder and curiosity, with lusty appetites and high spirits, that they embrace life, liberty and the pursuit of happiness with a burly, grinning bear hug. To be juicy is to be: a fearlessly joyous optimist, a troublemaker tirelessly afflicting the comfortable, a passionate lover of good talk and tasty food, an anonymous prophet hovering over the cosmological riddle, a frequent violator of the ordinance against indecent exposure of the heart, and a guerilla in the insurrection against Dream Molesters everywhere. Questions: Describe a specific incident when you were enthusiastic about a project. What was it? How did the people around you respond to your excitement? Did anyone try to take the wind out of your sails? How did you handle the situation? To Practice This Thought: The next time you feel like you need a nap, instead do something you are really excited about. Group Session Plan based on resources on Enthusiasm from www.spiritualityandpractice.com. For a PDF version of this small group ministry session, click here: Enthusiasm.